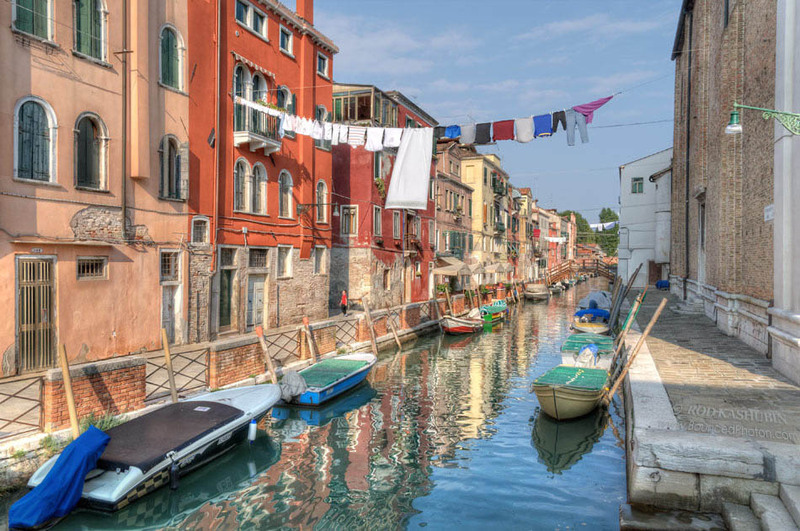 A view over Guiseppe canal on a sunny afternoon in one of the quiet Venice neighbourhoods. Far away from the city centre a gondola or a tourist will be a rare sight around here. A local boy is wondering the streets imagining he is finding his way through an old castle. A middle aged gentleman leisurely walking along Fondamenta San Giuseppe Castello after attending one of the local shops would nod and give you a buonasera. Showing it grandeur and yet giving the impression of being small and local, Venice is unique. It amazingly combines one of the most visited places on the planet with a down-to-earth character of a small provincial town. Where else would you be so close to your neighbours across the street to display a new set of family underwear you recently acquired? And if by lucky chance you are going to be around the area make sure you stop over the Antica Osteria da Gino restaurant that you can see down the street on the left. I have heard it is very good. 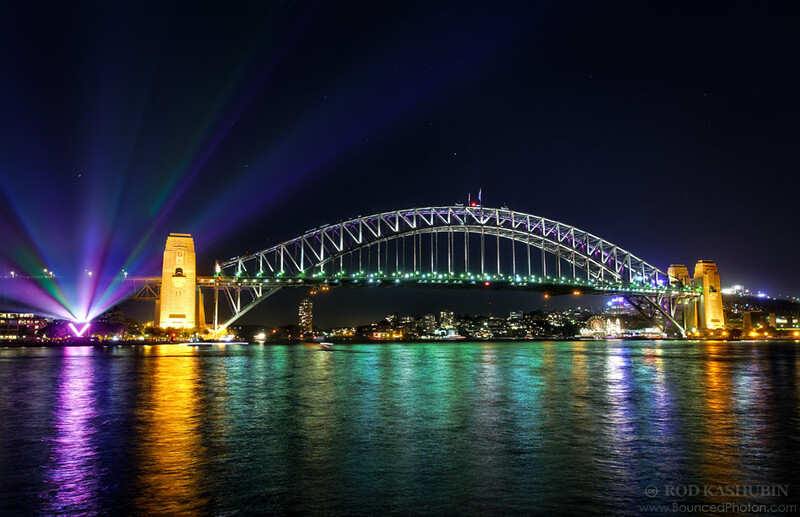 The best picture of the Sydney Harbour Bridge at night. That’s true as far as my roll of a camera film says and no one can disagree with that. Yes, I shoot digital. But film or memory card what was really great to realise (again) is the fact, or a pleasant surprise of a kind: you could not really tell for sure what the end picture will be like after the long exposure. That’s the beauty of it, the photography. You walk there with a tripod in a crowd of people thinking “Why am I really going to the Opera House when lights will be projected on to the Opera House? Shouldn’t I be on the other side? To see it?” You set up tripod, remote control, set all for 3 bracketing shots, thinking “Well, I have to do it just because of all the way”. Then goes click-click-cli-i-i-ick and whoa, look on all those rays and coloured water! Walking with a tripod on the streets at night seems to be quite a popular activity nowadays by the way. 1942 Fargo one ton truck by Chrysler. Picture taken at the Thirlmere Festival of Steam 2012. 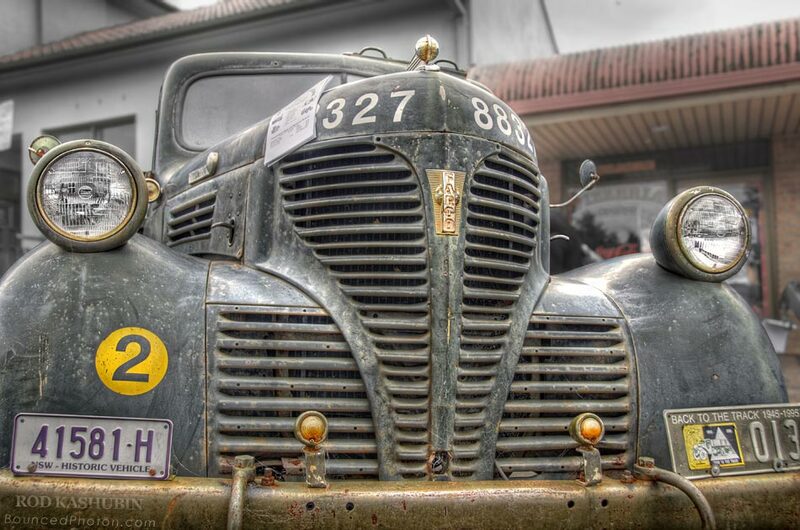 Not exactly a steam device itself, truck, however, was a prominent display item at this Australian country event. Created at first in 1913 by Fargo Motor Car Company in Chicago, Fargo truck business changed few owners over the last century. Yet almost a hundred years later it is still produced by one manufacturer, in Turkey. This particular one was built by Chrysler in Canada for the Australian Army and shipped as rolling chassis and cab to the windscreen. All behind the windscreen, including doors and the rest was built in Australia by T.J.Richards of Adelaide. It is likely a civilian model (not 4×4) powered by 6-cylinder 80 bhp motor with 3-speed transmission. There were only 17 built and this is the only one known to exist at this day. The image is a HDR composite from 3 bracketed photographs (-2, 0, +2 EV) taken handheld. Quite a good resulting sharpness for crouch style photography. After the event NEF format files were reviewed and edited to remove optical distortion, lens softness, purple fringing and exported to 16-bit TIFs. Combining those 3 TIFs into a single HDR file that what gives us 3-in-1 picture with a lots of details. As our monitors are not yet ready to display that sort of depth we create a slice of this big-pie-of-a-picture by tonemapping. We pick the best (the one with a cherry) and save it as 16-bit TIF for next level of processing. Next step is the most creative one. That where I choose to expose miniature surface details and add even more depth to the main object with the help of tonal contrast, desaturation, selective bokeh and vignetting. I am sure that even Mr. Chrysler himself would’ve been proud to see this picture. Big thanks to Tony for getting in touch with the owner and giving me extra info on the truck! 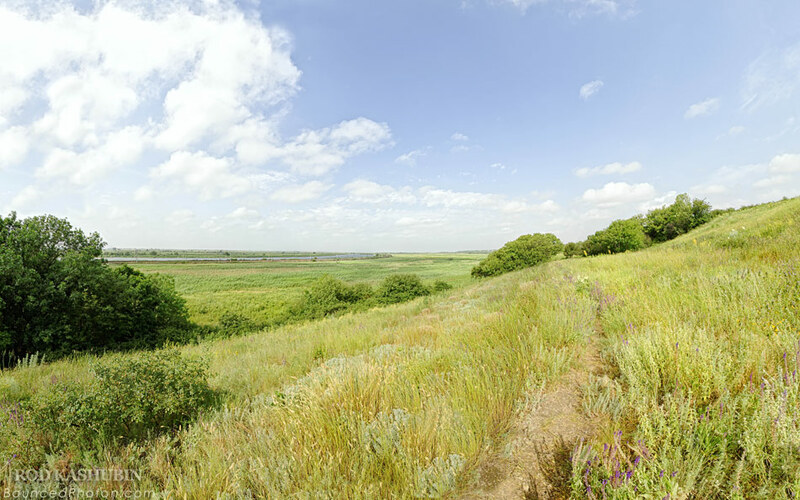 A morning walk through the summer aromas of wild flowers and herbs in Russian countryside. A hardly visible track leads the way through hills to the small village of Sinyavskoye. It is about 5km from Tanais railway station and there are several paths to choose. A dirt road goes along the wheat fields on the right. That`s the way the old bus will run getting summer residents to their dachas. Another trail on the left is showing the way via the meadow and along the rail tracks and the river. The quickest way, but with meadows getting flooded periodically it might be tricky to get through without getting wet. The scenic walk and my favourite one is along the hill slope. If you are lucky to be in the right time you can find ripe mulberries, sloes, and raspberries together with numerous birds, poisonous vipers and other local residents. The panorama is a stich of 10 vertical images (2 rows of 5 shots) taken handheld with short breaks to keep the mozzies away. Original images were treated against the lens distortion and softness, with then some extra work on contrast, tonal correction, colour balancing and with few dodge-burn touch ups. Not long ago we had a chance to stay at Dairy Park – a working farm in the Central Tablelands of New South Wales, Australia. Days were spent enjoying farm activities mustering sheep and cattle, driving around on ATVs and sitting near the fireplace after delicious dinner made from all the locally grown produce. One afternoon after seeing how sheepdog works and being amazed by the intelligence of this animal we drove up to the one of the highest hills on the property. Just as sun was setting down and the temperature was dropping to zero, I thought that I should have taken the gloves from the cabin. Frozen fingers, however, were very much worth the view. Perfect timing, perfect location and the sunset was stunning. On a technical side this photo is very simple. 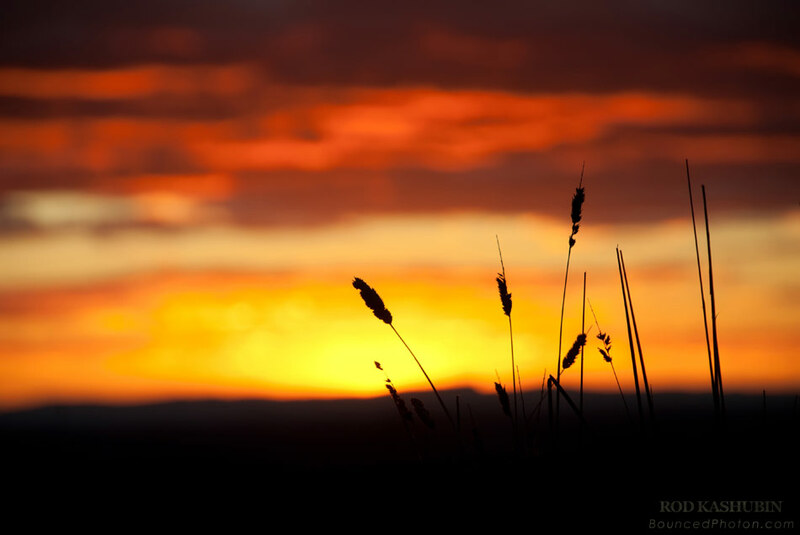 Just a single shot handheld on manual settings to darken the picture and capture the beautiful colours of the sky. No white balance or other adjustments will make it better, so I left it as is only applying noise reduction. Driving through long and empty roads of the New South Wales I was highly tempted to enjoy the beautiful scenery outside instead of keeping my attention on the road. The last time I was going this way about a year ago. That year Australia was on an edge of the record 9-year drought with 95% of state officially having not enough rain. With the end of 2010 all of that changed. There is now record amounts of rain pouring down, dams filling up, rivers are flowing on the roads and colours slowly change to greenish-bluish. In a particular spot where I stopped once again, instead of dry grass I am now seeing new green plants, a small tree and a pond. And if you have a closer look you can even notice a little duckling in the pond too. For this photo I took 12 pictures handheld (4 sets of -2,0,+2 EV) to cover the landscape around me as much as I can. I remembered that last time I had to work with a pretty small picture and thought it will be easier to crop later rather than return and re-shoot at the location. You can imagine it wasn`t too easy to align all of these handheld shots into a 1 single HDR panorama. On technical side this could be the most work-intensive picture to date for me taking over 3 days of work (24 hours plus). 12 NEFs were first treated for any lens imperfections they had and exported to 16-bit TIFs. Those were then combined into a panorama HDR file and send off to tone-mapping. The shadows and a contrast were corrected on a final step with colour desaturation to a more believable level. Final touches were to make the white balance right and reduce magenta colour cast followed by selective noise reduction and sharpening. Selective it is as grass was more prone to noise and could take more sharpening whereas sky was the opposite and liked noise reduced smoothness. Resulting 8462 x 4469 pixels panorama is pleasing to the eyes and could enjoy a really big canvas. Guess what? November just began, but Christmas is already around the corner. Well, at least according to the shops that are selling decorations and radio advertisements wishing Merry Xmas. Following the fashion stunning Christmas Tree at the Queen Victoria Building appeared on its usual place as well sparkling with thousands of crystals. Last year at the early morning of December I managed to take a quick photo of the tree and recently it was honored with a publication in Sydney Magazine. This year I decided to make version 2 of the image, this time taking my tripod and giving it treatment and level of detail it deserves. Here it is, a tone-mapped HDR from three bracketed shots. Post processing involved lens correction on RAW files, creating the HDR file itself, exporting it to 16-bit TIFF and then a lot of artistic layered work on contrast with dodging and burning to bring out shadows and to add volume. Finishing touches were reducing the noise and adding a dash of vignetting. Huge crowds, fantastic sounds, unusual dance performances, that`s all was there for everyone at the Sydney Festival First Night. All types of music was played around the city during the night, from traditional bagpipe tunes to 100 saxophones at once, from funk and hip hop to tribal Polynesian rhythms with a grand finale of soul hits from Al Green. A perfect blend of contemporary and classic. 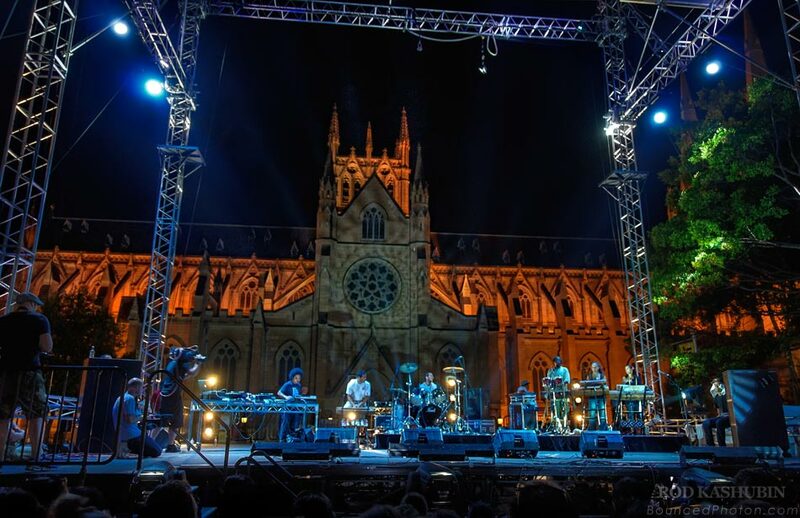 The stage before St Mary`s Cathedral, Hyde Park Fountain site, was featuring DJ Dexter of The Avalanches fame, Papua New Guinean Drum Drum log drumming group and the Pacific Islander Krump crew Royal Fam among the other artists. The photo was taken handheld while holding a camera up above the crowd. It was then processed for optical distortions with a touch of pseudo HDR and tone-mapping finishing up with extra contrast and lowered noise. Cockatoo Island dockyard in Sydney Harbour was of a significant strategic importance during WWII. As one of the main repair facilities in the Pacific for vessels damaged in the naval battles of 1942 it was critical to protect it from possible air attacks. 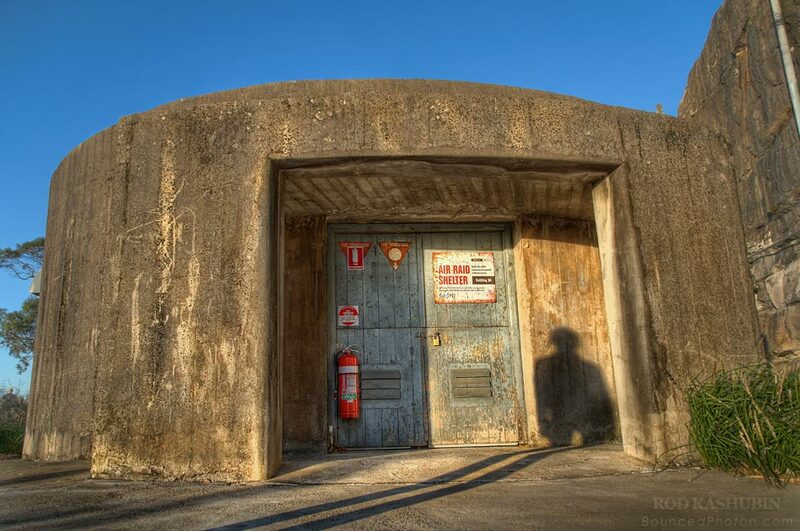 Therefore, several projects were undertaken and included building of the tunnel through the island rocks, the first aid station, search light and a number of concrete air raid shelters. Even though impressive by the appearance I wonder how good those wooden doors were as a protection against an explosion shockwave. If I remember correctly, the good design of such a shelter should include a barrier against an explosion with the entrances usually placed on its sides. Anyway, the shelter was luckily never tested as there were no air raids on the Sydney Harbour as far as I know. The sunset HDR was made out of the 3 standard exposures -2,0,+2EV. I set up a tripod low on the concrete path and was lying on the ground looking on the camera`s LCD screen. The tourists were passing by with their shadows moving along the shelter walls. That gave me an idea and I asked my wife if she would not mind to be a part of the composition. A bit of work on tone-mapping, contrast, desaturation, sharpening and here comes the picture of Cockatoo Island Air Raid Shelter. 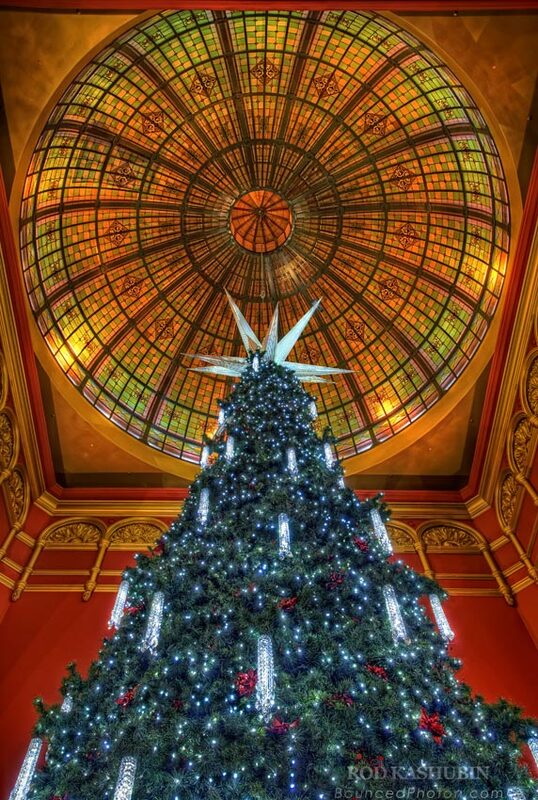 Every year there is a huge Christmas tree set up in the Queen Victoria Building, the nineteenth century shopping centre in the centre of Sydney. It is big and it spans three floors from the roof to the bottom. What is fantastic is that it has a different appearance every year. This year it is sparkling with thousands of crystals and lights creating a stunning view as you can see. I took this photograph early in the morning on 24 of December 2009. Not many people at all in the CBD before Christmas holidays. 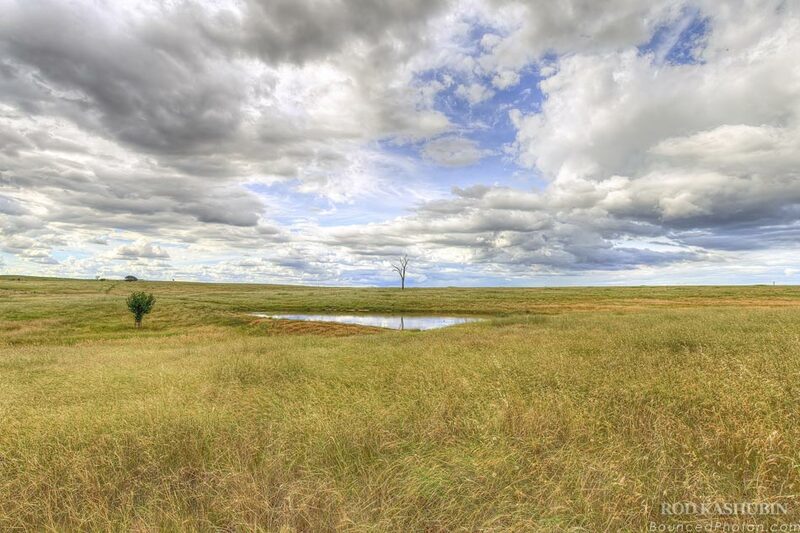 This is a tone-mapped HDR out of a single RAW processed with moderate saturation settings. 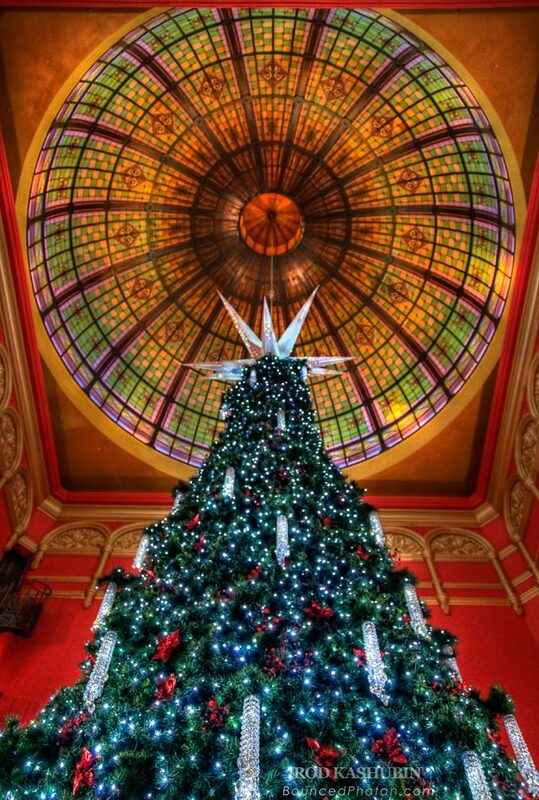 There was not enough light in that part of the QVB, mostly natural light, so the post-processing helped to bring out the colorful details of the tree and the glass dome.